The Adjustable Roof Mount for Garden Weathervanes will fit any "Good Directions" garden size weathervane. Transform your garden weathervane to a "Roof Top Spectacle of Beauty"! This garden weathervane roof mount works with garden-size weather vanes sold separately. With this unit holding a weathervane at the top of your house, garage, cupola, barn or gazebo, the wind won't blow in vain. 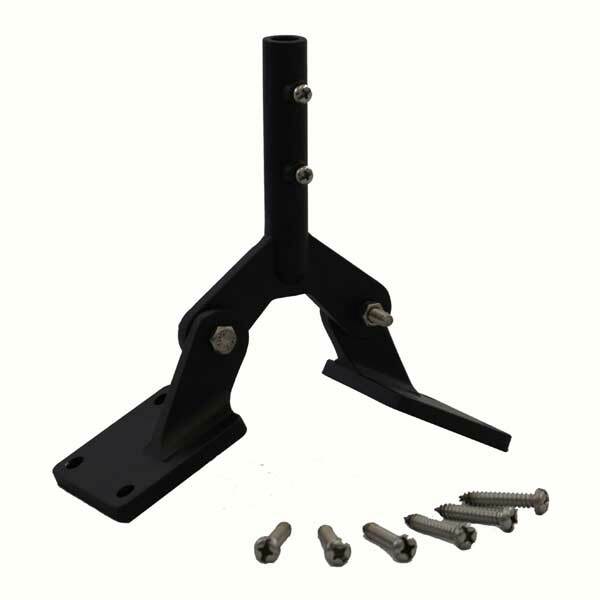 Adjustable and easy to install, this black steel mount will hold your weathervane on a standard rooftop, so you can enjoy the direction of the wind first hand instead of from a TV or an NOAA radio voice. Dimensions are 3 inches D x 9 inches W x 6 inches H.
Comes with 6 mounting screws.